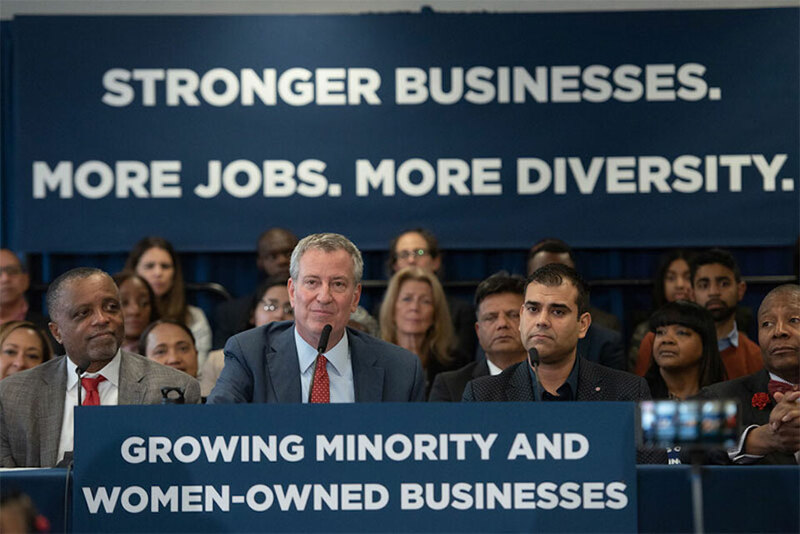 NEW YORK––Mayor Bill de Blasio, business leaders, advocates, and elected officials recently announced a State proposal that would create more economic opportunity for minority- and women-owned business enterprises (M/WBEs) in New York City. In 2015, Mayor de Blasio outlined his plan to create a more resilient, sustainable and equitable city in his OneNYC Plan. Within this plan, the Mayor set a goal to award $16 billion to M/WBEs by 2025 to help level the playing field for M/WBEs. Since then, the City has awarded over $10 billion to M/WBEs and increased the goal to $20 billion by 2025. This goal includes Mayoral and non-Mayoral agencies, such as the Economic Development Corporation and the Department of Education.In 2016, when the Mayor announced the creation of the Office of M/WBEs, the Mayor set a goal to award 30 percent of the value of mayoral agency contracts to M/WBEs by 2021. By the close of 2018, these same agencies alone awarded more than $1 billion to M/WBEs, or 19 percent of the value of City contracts subject to the M/WBE program. In 2017, the City also launched the Bond Collateral Assistance Fund, which supports M/WBEs and small businesses facing market barriers in accessing surety bonds, by offering affordable bonds that provide collateral to ensure businesses have the opportunity to perform on City construction contracts. The program allows eligible businesses to apply for collateral assistance of up to $500,000 or 50 percent of the Contract amount, whichever is lesser, in order to meet cash collateral bond requirements. No contributions are required of contractors.More on these loans can be found here.